It's finally Friday! What do you have planned for the weekend?? I'll be with my sister outside of Houston and in Galveston for the weekend. Weddings + beaches, here we come. :) SO excited! I feel like it's been forever since our weekly drawing + short story. Remember this? I know you'll recognize her. This story references a dear friend of mine, but for the most part (like 90%), it's purely fictional. I think of this song when I look at this drawing and read the story. The tinge of the awkward silence sliced the air like a freshly sharpened blade whipping through soft butter. Her soon-to-be ex-boss stared as she blew a stray hair away from her face and proceeded to cover her mouth with her right hand; a gesture she never failed to unconsciously use in times anxious thought or confrontation. “Are you positive about your decision?” he proded. She felt her cheeks burn and knew all too well that they now matched the flushed color of the cushion she was sitting on. Noticing that her hand was covering her red lips, she lowered them to her legs and straightened her back. She hated how she always slouched. Her correction of posture would be one of the many changes in a new life. “I’m sure,” she said, eliminating the tremor trying to creep into her voice. Ahh, Monday! The thought of this day usually brought so much sorrow and disappointment, but now, it marked a new beginning; one that she had somehow managed to survive without for years. She nodded in his direction, knowing all too well his annoying need to add in the last cutting words to every degrading conversation. Her cheeks were still bright, but this time, not because she was afraid. Instead, she felt full; full of energy, happiness, accomplishment, and excitement. After closing the thick glass door to the cold office for the last time, she made her way across the slick concrete floors straight toward the silver elevators. She pressed the smooth, convex button indicating the heavy box’s descent down the building, relishing in the thought of finally wrangling herself free from this large dungeon of a skyscraper. She wasn’t even aware of the smooth ride in the elevator and her brisk walk through the murmuring lobby as she neared the fresh air. Before she knew it, she was out of the structure that had squashed her dreams for so long. She shielded her unready eyes from the staggering sun, turning around only once to look back at the towering blue and green panes of glass above her. Her eyes were almost completely shut against the intensity of the sunlight, and her cheeks flushed a bright coral pink. She had always hated these two characteristics about herself: her thin eyelids coated with thick black lashes always threatening to close against her intense gray eyes, and her cheeks continually burning with fury. In fact, it was a family joke that her eyes were shut in just about every childhood photo, and her parents had named her Rosalinda due to her uncommonly rosy cheeks as a newborn. They had planned on naming her Melinda beforehand, but those cheeks didn’t allow it. So, Rosa she was. Noticing her squinting eyes and rosy cheeks, Rosa smiled to herself, no longer treating her funny characteristics with contempt. After all, she carried her name proudly, and although her eyes more often than not closed against the rays of the sun or flash of a shutter, a flurry of happiness encompassed her. She was wide awake to the exciting future ahead of her. Danie! I hope you enjoy your time with your sister in Galveston, sweetie! Ines: Thank you, dear! Ha, now how did you guess?? :) That name must have given it all away. You're absolutely right. Hope you have the best weekend also! Huge kisses and hugs back to you! A perfect drawing. I love the design of your blog, the bananas are so cute! Oh my-the blush on your illustration is simply amazing! So glowy and fresh! Holy macarroni! The eyes! The detail! Danie, you are my hero. Pinning! 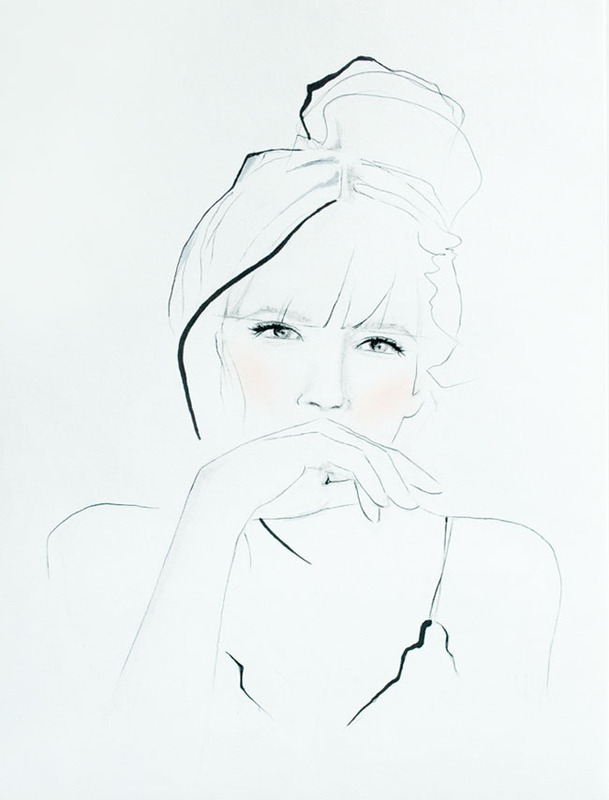 I love this drawing, especially the thick dark lines and touch of blush. Talented lady you are! Deepa: Thank you so much!! It means the world to me.